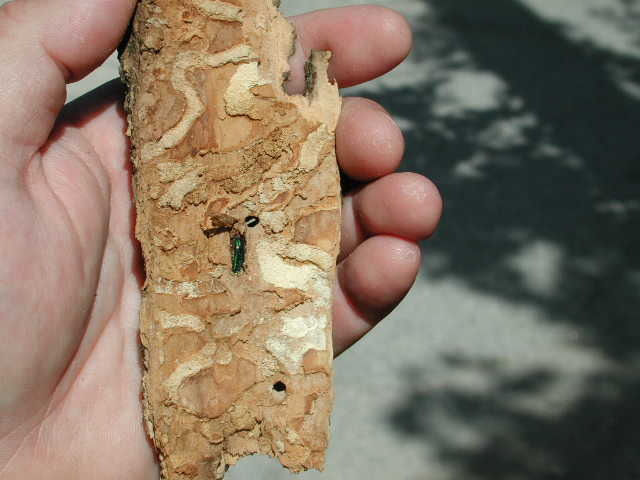 Emerald ash borer (EAB) is an invasive wood-boring insect that was introduced into North America from China and eastern Asia. EAB attacks and kills healthy and stressed ash trees. All ash species are susceptible in varying degrees. EAB was recently detected in Winnipeg. Once detected, it cannot be eradicated. Long-term, it is recommended the City of Winnipeg use the "Slow Ash Mortality," or SLAM, approach to EAB management which is the approach being applied in most Canadian cities dealing with EAB. A percentage of eligible ash trees on public properties will be injected with an approved pesticide to preserve them as long as possible. The remaining ash trees on public properties will be removed as they die and possibly replaced over time. Over the next year, the City will be focusing on a survey to determine the current extent of the infestation, creation of a temporary Supervisor of Forestry Technical Services position to plan and implement our EAB response, removal and disposal of infested ash trees growing on public property, treatment of some public ash trees, expanded EAB monitoring, and public awareness and education. For more information about the City’s Emerald Ash Borer Emergency Response Plan for 2018, please see the Emerald Ash Borer Preparedness, Response and Management Options report. To slow the spread of emerald ash borer into new parts of Canada, the Canadian Food Inspection Agency (CFIA) has updated its regulated areas for emerald ash borer (EAB) to include the City of Winnipeg. Effective immediately, the movement of ash materials, including logs, branches, woodchips, ash nursery stock/trees, and all species of firewood out of Winnipeg is restricted. Because emerald ash borer can spread across long distances, the public plays a key role in helping to control the spread of emerald ash borer by not moving potentially infested materials. For more information, please see the CFIA website. Q. What is EAB and what does it do to our trees? 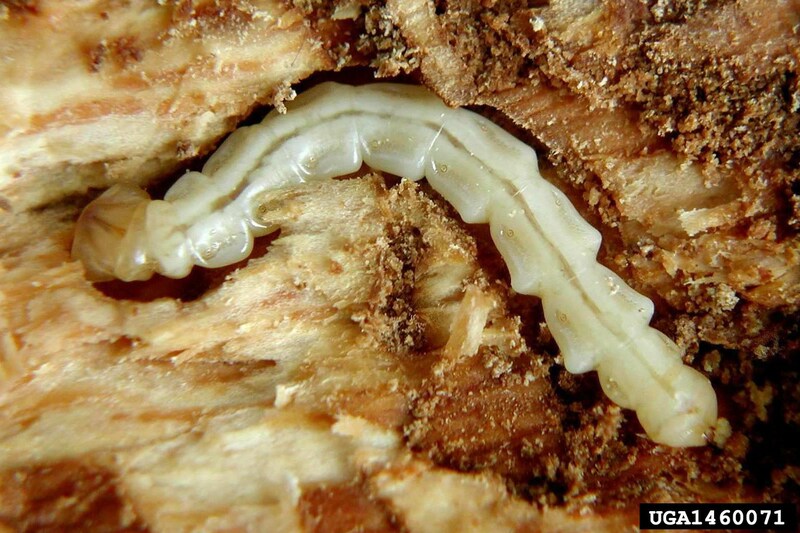 A. EAB is an invasive pest introduced into North America from China. It feeds on and kills ash trees whether they are healthy or stressed. It is the larval stage of the beetle that kills the tree. The larvae feed on the tissue underneath the bark. The larval feeding girdles the tree, cutting off the flow of nutrients and water causing the tree to die. Q. Does EAB attack all trees? A. EAB attacks only ash trees of Fraxinus genus. All ash species are susceptible in varying degrees. Mountain ash is not an ash tree. Q. Is the EAB beetle in Manitoba? A. Yes, EAB has been detected in Winnipeg. Once detected, it cannot be eradicated. We are currently working with our partners to determine the extent of the spread within the city. Q. What effect will the EAB beetle have on Winnipeg? A. The City of Winnipeg is at risk to lose all of its ash trees over a 10-year period, resulting in a loss of at least 30% of our boulevard and park trees valued at approximately $437 million. Many ash trees on private property are also at risk of becoming infested over the next decade. Q. How did EAB get to Winnipeg? A. It would be difficult to determine how EAB arrived in Winnipeg. EAB is spread mainly by people moving firewood, nursery stock, trees, logs, lumber, wood or bark chips. All these forms of wood can contain EAB larvae. The beetle can also fly several kilometers. A. Long-term, the City of Winnipeg will be using the "Slow Ash Mortality," or SLAM, approach to EAB management which is the approach being applied in most Canadian cities dealing with EAB. A percentage of eligible ash trees on public properties will be injected with an approved pesticide to preserve them as long as possible. The remaining ash trees on public properties will be removed as they die and possibly replaced over time. The goal is to spread out the mortality of ash trees over time to allow more proactive management of tree removals and replacements, and to preserve our healthy ash trees for as long as possible. Q. How much will it cost for the City to manage EAB? A. Total estimated cost to manage the impacts of EAB over 10 years is $90 million for ash trees on public property only. It is estimated 72,100 ash trees would be removed from boulevards and parks, approximately 28,830 ash trees would be treated, and approximately 64,900 trees would be replanted. Costs would not be equally distributed each year over the 10 year period and would potentially peak in year five of management. After the 10-year period of active management, a low level of EAB will remain in our urban forest as long as there are ash trees. Treatment of ash trees would continue past the 10-year period but with a lower volume of ash trees. Q. How much will it cost to manage EAB in 2018 and what will that go towards? A. $1.3 million was recently reallocated to the Emerald Ash Borer Emergency Response Plan for 2018. This plan includes a survey to determine the current extent of the infestation, creation of a temporary Supervisor of Forestry Technical Services position to plan and implement the response, removal and disposal of infested ash trees on public property, treatment of some public ash trees, expanded EAB monitoring, and public awareness and education. Q. I've noticed ash trees marked with a purple dot in my neighbourhood. What does that mean? A. Ash trees marked with a purple dot have been scheduled for removal. All ash trees that are removed will be either chipped on site or disposed of at an approved disposal site to minimize the risk of the beetle being introduced into another area of the City. The planned removal of these trees and injection of select trees with an approved pesticide is an essential component of the City's Comprehensive EAB Response Strategy to slow the spread of EAB and the mortality of ash trees within the City of Winnipeg. Most ash trees on boulevards and in parks throughout the entire City will eventually be removed over a span of 10 years. Q. I've noticed ash trees marked with a grey dot in my neighbourhood. What does that mean? A. Ash trees on boulevards and in parks that have been marked with a grey dot represent trees the City has selected as candidates for trunk injection to manage emerald ash borer. The pesticides used are approved by the Pest Management Regulatory Agency (PMRA) and will be applied by licensed pesticide applicators. These trees are in good to excellent condition and have been selected based on a comprehensive set of criteria. Injections will have to be repeated on a two year cycle as long as the tree(s) meet the treatment criteria. If you have any questions or concerns regarding the products used, please check the Insect Control website or contact 311 for more information. Q. Some of the ash trees slated for removal look healthy. Why are you removing them? A. We understand that the sudden loss of many seemingly healthy trees can be a very disappointing change to the landscape. However, in its early stages, EAB infestation in a tree is almost impossible to detect - trees that appear healthy can be infested. Left uncontrolled, EAB spreads quickly, killing all ash trees in its path in a short period of time, leaving dangerous standing dead trees. Tree replacement is being planned however, funding for planting has yet to be confirmed. It may not be possible to replace every tree due to suitability guidelines. Q. What is the City doing about my private ash tree? A. 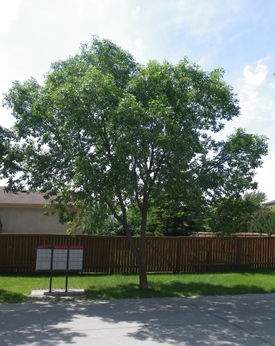 The City of Winnipeg will not treat or remove ash trees that are on private property. These trees are the responsibility of the property owner. Property owners are encouraged to contact a qualified licensed and insured professional arborist for treatment options or a management plan that best suits their needs. Please note that injection treatments must be performed by a Manitoba Licensed Pesticide Applicator. For more information about hiring an arborist, please visit the Trees Winnipeg website. Trees Winnipeg also provides support to property owners for tree planting on private properties through the Winnipeg ReLeaf Program. Q. What can I do to save ash trees on my property? A. You can choose to hire a licensed pesticide applicator to inject ash trees on your property with an approved pesticide to preserve them as long as possible. This needs to be done annually or every two years, depending on the pesticide used and level of EAB population in the area, and is estimated to cost approximately $300 to $500 per application for an average mature tree. Q. If I remove an ash tree from my property, how should I dispose of it? A. Property owners are encouraged to do one of the following with the ash trees that are removed from their property: 1) hire a qualified, licensed and insured professional arborist to remove their affected ash trees and chip them on site, 2) take their ash tree material directly to Brady Road Resource Management Facility (without leaving the Regulated Area) for disposal, or 3) burn ash material on site (outdoor burning requires a burn permit). Please note that no untreated ash material can leave the Regulated Area/City of Winnipeg - this includes ash logs, branches, woodchips, nursery stock/trees, and all species of firewood. For more information about transportation of ash material or firewood outside the Regulated Area visit the CFIA website. Q. What has the City done to prepare for EAB? removing ash species from its reforestation program. Q. Do other places in Canada have EAB? A. Yes, the beetle is currently in northwestern and southwestern Ontario, southern Quebec, and in 31 states in the United States, including Minnesota, and is now in Winnipeg. Q. What can I do to prevent the spread of EAB? Q. What does EAB damage look like? bark splitting where larval tunnels occur underneath the bark. suckering of shoots on the trunk of the tree. Q. 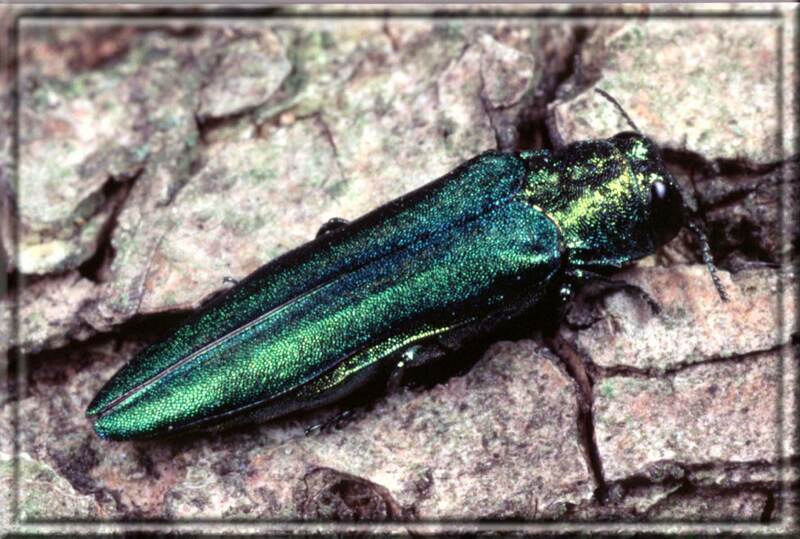 What does the emerald ash borer look like? A. Adult beetles are metallic green, narrow, hairless and approximately 1.25 cm (1/2 inch) long and .3 cm (1/8 inch) wide. Mature larvae are approximately 2.4 cm (1 inch) long and creamy white. The body is flat, broad shaped and segmented. Q. What should I do if I think my tree has EAB? Contact 311 or contact the Canadian Food Inspection Agency or call the Emerald Ash Borer hotline at 1-866-463-6017. Q. Who regulates the management of EAB? A. Prevention, response to and management of EAB are regulated federally by the Canadian Food Inspection Agency (CFIA) under the authority of the Plant Protection Act and Regulations, and provincially under the authority of the Forest Health Protection Act and Regulations. The City of Winnipeg is mandated to manage EAB in accordance with federal and provincial legislation. Canadian Forest Service (CFS) has also released a publication entitled "A Visual Guide to Detecting Emerald Ash Borer Damage." This publication is available at no charge by calling CFS, Great Lakes Forestry Centre at 705-949-9461. It can also be ordered online from the CFS website and is available in English or French.